The SCOTTS® SYNC™ System Cordless Lithium-Ion String Trimmer is the perfect addition to all of your SCOTTS® lawn care products. The innovative charging station allows the user to charge the battery on the tool or alone like a traditional charger. The wall mounting charger doubles as a hanger for the tool; no more excuses for an unorganized workspace. Powered by the SCOTTS® 20V, 2.0 Amp Hour battery, this trimmer is recommended for lot sizes up to 1/3 acre on a single charge. 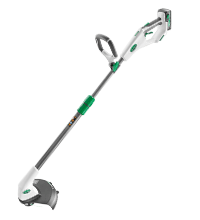 The 2-in-1 shaft retracts and extends to accommodate the user's height and also rotates 180 degrees for easy edging. The adjustable cutting width on the string head can be set to 10 inches for extended battery life or 12 inches for a larger cutting path. Backed by a 3-year warranty, the SCOTTS® SYNC™ System String Trimmer is engineered for performance and durability.